Coconut has its own flavour and is enriched with many vital nutrients. It is a superfood that must be added to the pregnancy diet as it is good both for the mother and the baby. Coconut consumption in any form, whether it is solid, coconut oil, tender coconut, ripe coconut all are all good for the health of the mother-baby duo. It helps with the proper growth and development, boosts the breast milk production, helps in combating joints pain etc. Let us now study how safe is its consumption during pregnancy, its health benefits, the risks associated with its consumption, having dried coconut, consuming it in the first trimester, and the proper ways to consume it. When it comes to coconut milk, the nutrition value increases. Half cup of coconut milk has 296 calories. Similarly, the level of potassium in coconut milk is 316 mg. It also contain 2 mg of Iron. Is Eating Coconut Safe During Pregnancy? Super Loaded With Minerals: Coconut is enriched with minerals, vitamins, fibre etc. If taken in moderate quantity it can help in the prevention of blood loss, urinary tract infections (UTI), nausea and swollen feet. An Excellent Source Of Good Fat: It has good fats which can help to flush the toxins from the body. Coconut milk is an ideal choice for the pregnant ladies as it offers good fats, helps in the healthy growth of the baby. Excellent For Breast Milk Production: If you eat coconuts regularly during the entire gestation period, you will not be in short of breast milk after deliver. This is because coconut contain lauric acid, which is an important constituent of breast milk. Provides All The Goodness Of Virgin Coconut Oil: The coconut oil is taken by cold-pressing of the coconut and hence also known as virgin coconut oil since no heating, bleaching, deodorizing are used for the same. Easy To Incorporate In preganacy Diet: Coconut can be used for the preparation of many dishes. It can be used in different forms. Shreadded coconut, roasted cocnut, coconut milk, coconut oil, coconut powde, etc. All are easy to incorporate into the pregnancy menu. Good For Skin: Application of coconut oil helps in keeping the skin supple, helps in the removal of stretch marks and itchiness that happens during the pregnancy phase. Since the oil has an extensive amount of lauric acid as well as Vitamin E, it indeed is the secret for keeping one beautiful through and post-delivery. Promotes Overall Health: The coconut water has a good amount of water content and is not high on calories as well. This even helps to control the blood sugar levels, prevention of dehydration, fatigue and drowsiness, is good for digestion etc. Alleviates Constipation And Heart Burn Since coconut has good fibre, it works as a laxative and relieves from constipation. Constipation is a common, yet, annoying issue during pregnancy. Likewise, coconut is excellent in combating another annoying issue during pregnancy- the heart burn. Prevents Anemia: Coconut milk is rich in iron and therefore, drinking coconut milk in moderation helps to combat anemia. Alleviates Foot And Leg Pain: Incorporating coconut in pregnancy diet helps to enhance the blood circulation. Foot and leg pain during pregnancy is mainly due to poor blood circulation. Therefore, coconut during pregnancy helps to alleviate pregnancy pains. Boosts Immunity: It is an ideal source of electrolytes, vitamins, minerals, enzymes and is known for boosting the immunity system. 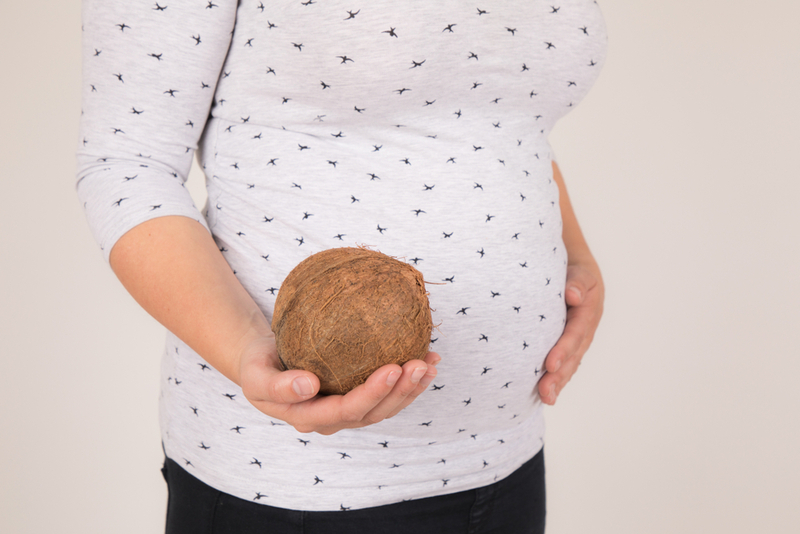 Is Dried Coconut Equally Beneficial During Pregnancy? The first trimester is a very crucial period both for the mother as well as the baby since maximum changes and development happens at this time, the baby at this time is also vulnerable to damages of medication, alcohol etc. Since coconut has a good quantity of fiber calcium and vitamins, it surely is a safe way to sail through this period as coconut is highly beneficial for the health of both. What Are The Complications Associated With Consuming Coconut When Pregnant? The extended usage of a diet loaded with coconut could lead to difficulties especially for the obese women as their cholesterol levels can shoot up instantly. A mother-to-be who has developed allergies towards pollen and plants from the coconut family before pregnancy or any products made with coconut should also not try the same throughout their pregnancy phase. The intake of coconut water should never be dispensed as a replacement for saline transmission without medical guidance as it could be dangerous. It is advisable to drink coconut or eat coconut first thing in the morning on an empty stomach as it helps to boost the metabolism and even helps in weight loss. It is best to consume it as soon as it is cut since it is fresh and heavily loaded with nutrients. Never pick up a coconut which has cracks, look for the one that that has more white pulp and is heavy to carry. In case the coconut is heavy, it means more water and better quality. It is advisable to drink coconut water frequently to avoid dehydration, to replenish cells, regain energy and to fight out stomach ailments as well as infections. Therefore, coconut is a wholesome meal, full of taste as well as nutritive qualities and coconut can be had in any form, all of them have equal health benefits to be able to fight out infections and keep one healthy and fit.